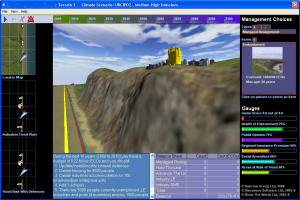 This project was carried out by Discovery Software and Halcrow. The project was funded from the Innovation Fund, which forms part of the Government’s Making Space for Water program. Making Space for Water is a cross-Government strategy, launched in 2005, which takes a long-term and sustainable approach to flood and coastal erosion risk management. Its aim is to manage risks through a range of approaches, which reflect national and local priorities, and which combine a reduction in the threat to people and their property with the delivery of the greatest environmental, social and economic benefit. The need to balance economic, social and environmental needs. The need to plan over the long term. The potential impacts of climate change on the coast. CoastRanger MS presents a virtual coastline within a pc-gaming type environment. CoastRanger MS incorporates a legacy of past developments and defences, and uses a coastal process simulator to predict the impacts of climate change under different management scenarios chosen by the user. 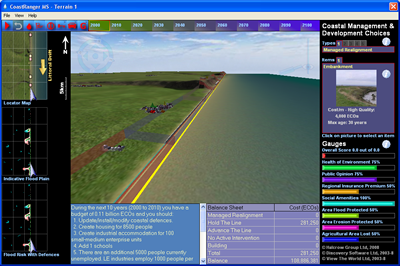 Users are able to make various decisions about the management of the virtual shoreline and then see the consequences on screen. It represents a real world coastline approximately 16km long with soft cliffs, coastal villages, towns and cities and agricultural land. It has two cliffed sections. The cliffs are composed of soft sediment. There are a number of low lying areas. There are areas backed by sand dunes and gravel barriers. The littoral drift is unidirectional from management unit 1 in the north towards management unit 16 in the south. There are a number of heritage sites situated along the coast and several environmentally designated areas including dunes, terrestrial cliff habitats and wetland areas. 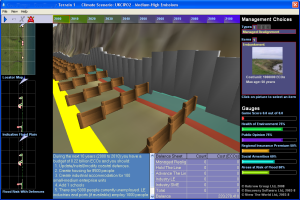 The virtual coastline is split into 16 management units each with different combinations of morphological features. Coast Ranger MS will test your strategic skills. You will have to anticipate the effects of climate change, and balance the needs of people and the environment by building defences, houses, businesses and infrastructure. There are a number of heritage sites situated along the coast and several environmentally designated areas including dunes, terrestrial cliff habitats and wetland areas. 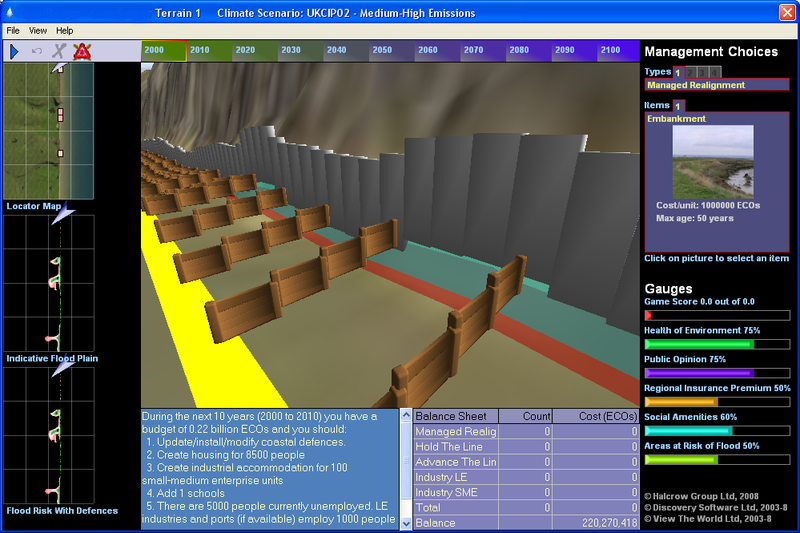 Manage flood and coastal erosion risk levels to various features by choosing different management options. Maintain / restore / improve natural and historic environments by choosing different defence options. Provide social facilities by adding housing, hospitals, and schools for an expanding population. Provide employment for an expanding population by adding industrial facilities. Keep financial expenditure within allocated budgets. The Tutorial sections explain how users undertake these actions within CoastRanger MS.